Bitdefender Antimalware Security Tools has many features to protect users and networks from both online and offline threats. Endpoint Client Security features include anti-malware protection, firewall, and browser. Antivirus clients use a multilayer protection model that combines signatures, heuristics, and behavioral control to prevent malicious attacks. To protect devices against both physical and offline malware threats, Endpoint Client Security products scan CDs, DVDs, thumb drives, or storage devices for malware threats. BEST (Bitdefender Endpoint Security Tools) is a fully automated computer security program that is managed remotely by your network administrator. Once installed, it protects you against all types of malware (such as viruses, spyware and Trojans), network attacks, phishing and data theft. It can also be used to enforce your organization’s computer and internet usage policies. BEST will take most security decisions for you and will rarely display contextual alerts. The details of the actions taken and information on the operation of the program are available in the Events area. This article provides instructions for manually updating BEST, using weekly update files. Follow the steps below and choose the correct procedure for your operating system architecture. Does Bitdefender Endpoint Security Agent connect to Bitdefender Cloud servers outside my company? Yes. Endpoint Security inherits the latest technologies developed by Bitdefender, some of which use off-site scanning technologies for improved performance and optimal footprint. The ultimate benefit of our off-site technologies is that any endpoint in the enterprise will be constantly connected to this updated repository hosted by Bitdefender. In addition, the Bitdefender endpoint agent relies on proprietary caching mechanisms to minimize traffic and optimize the performance of the analysis. 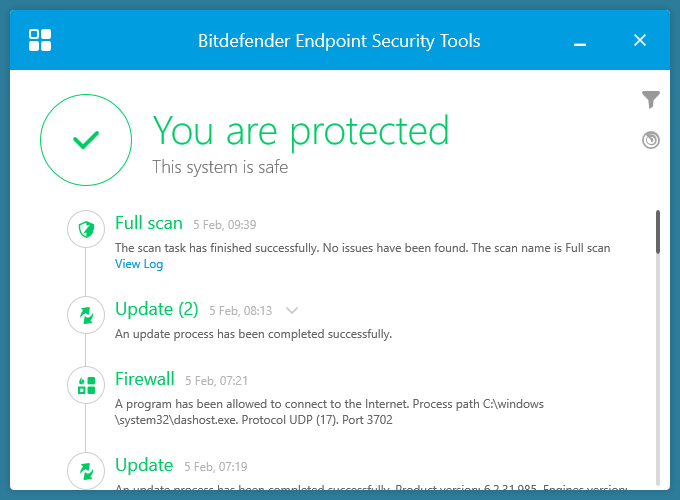 What features of Bitdefender Endpoint Security Agent use off-premise scanning? Real-time validation of any website through immediate access to Bitdefender Cloud Services. The antiphishing feature also uses Bitdefender’s off-site scanning technologies. Every hour, phishing sites are created to create engineering scams: users steal their personal data from fake websites that mimic the online properties of real organizations. Our phishing research labs can identify new phishing threats and improve detection to extend the level of protection of devices by identifying the latest phishing and fraud attacks on the market. The anti-malware feature uses off-site scanning technologies to add an extra layer of protection against the latest and most damaging threats, as well as one-day malware detections monitored by our AVC module. Our Bitdefender cloud services are able to analyze the latest market threats and provide immediate response to potentially harmful processes running on your computer. As such, even if your endpoint has not yet downloaded the latest signatures, querying Bitdefender Cloud Services will still provide quick protection against these types of threats.